What is the Time Timer? It is a clever timer that shows elapsed time. Is your New Year's Resolution to be more organized or have a ten minute cleanup? What better way than to use the Time Timer. Throughout your hectic day, the Time Timer is there to remind you when it’s quiet time... or yoga time... or dinner time. Today, more than ever, we are challenged to do more with less, and wherever time needs to be managed or measured, you can count on the Time Timer to make every moment count. 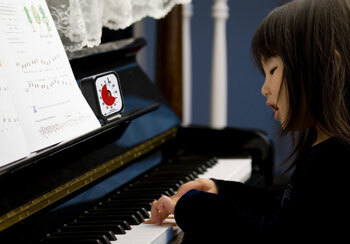 What about New Year's Resolutions for your children? Maybe a certain amount of time reading, or practicing piano? The Time Timer helps individuals judge how much time is left — even if they can’t "tell" time. Time Timer products feature high visual contrast, large dial numbers and ultra-quiet operation, making them perfect for special needs counseling, therapy and rehabilitation sessions. 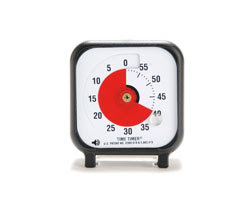 Perfect for both individual and group settings, the Time Timer helps make every moment count. I currently home school both my daughters. We had the opportunity to review the 3" Time Timer and found it to be useful in our classroom. It was lightweight and came with a protective plastic cover. 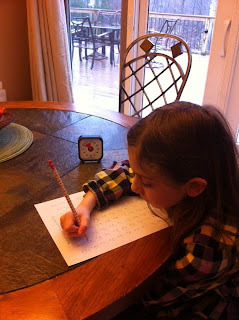 My oldest daughter is working on Multiplication. We are working on increasing her speed in order for her to be able to quickly do her problems. So, we do a lot of drills. The problem we were having was that she would get so anxious with timers that tick or digital ones, where she could see the numbers quickly flying by. The time timer is a visual timer. It did not have any of those annoying ticking sounds or loud buzzer. My daughter said she felt like the time wasn't flying by and found it to be more enjoyable or as enjoyable as math drills can be. It was also useful for my youngest so she could visually see how much time she had left or quiet time. Rather than the continuous question of How much longer? I will be taking it on our next road trip and setting it so that they can see just how much longer it will be to get to our destination! Time Timer also offers many different products, timers (which come in 3 different sizes), watches, software, even Apps! Would you like to win your own 3" timer for your New Year? Simply fill out the Rafflecopter form below. And for more information, check Time Timer out on YouTube. The opinions and thoughts expressed are my own. I received a 3" time timer for my review but I was not under any obligation to give a positive review. To make our lives more simple. My new year's resolution is... I belief that I can do anything I want to and then go complete all my dreams. My new years resolution is to learn how to be a better person than I was last year! Mine is to get more organized! I am going to do things that will keep or better my health. I am also planning on releasing more clutter from my life. I don't have a specific resolution. My goal is to try to make little changes each day. My resolution is to say NO. I find myself saying yes when I really wanted to say NO. I hate hurting anyone's feelings but more than that I hate resenting having said yes when I meant NO. I gotta loose this baby weight! I resolve to put more effort into staying on top of my home life. I resolve to start looking at things in a more optimistic light. My resolution is to be healthier. Mine is to slow down and relax more. I'm getting on the 'get in shape' wagon! Mine is hit the gym more often; so far so good!